"If you're going to dream," says Joyce Martin McCollough, "have BIG dreams because they're the kind of dreams that God has for you." Joyce, her younger brother, Jonathan Martin, and their younger sister, Judy Martin Hess, should know. 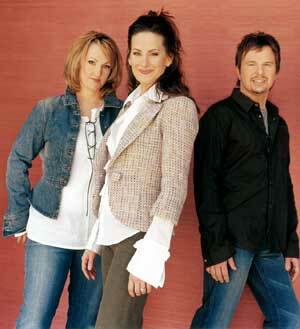 Together these talented siblings make up the award-winning trio, The Martins. Joyce, Jonathan, and Judy began their journey of dreams in an 800-square foot, single-wall cabin in rural Arkansas. "You could see the dogs and the cats and the chickens under the house. During the winter, we would gather around the fireplace because it didn't have electricity or anything like that. We would hold the quilts in front of the fire and get them really, really, really hot, then wrap up in them and run and get into bed--all wrapped up to stay warm." Although finances were scarce, those years in that cabin yielded some of the best memories for Joyce, Jonathan and Judy--and, for the rest of us, one of the best contemporary Christian groups of our day. Joyce reports, "During that time, God began to give us a love for one another -- and we started singing." Taking her text from a hymnbook, the children's mother taught them to sing just for daily entertainment. Seven-year-old Jonathan and 6-year-old Judy learned the melodies. Mama and 9-year-old Joyce added the harmonies. Not long after, Jonathan began hearing harmonies on his own, so Mama sat out, saying, "You all don't need me anymore." A trio--The Martins--was born. One of their first performances was in their home church. Within a few years they were recording independent albums, performing full time at churches and concert halls, and growing up on the roads of Arkansas, Missouri, Texas, Louisiana, Tennessee and more. Then came their biggest concert: a 1992 performance in the ladies' restroom in Indiana, with an audience of one. Mark Lowry and Michael English of the Gaither Vocal Band were recording a Gaither video and invited The Martins to tag along. At the chosen moment, they crammed the siblings in the bathroom and called Gloria Gaither over for an impromptu, a cappella version of "He Leadeth Me." Gloria was so touched, she told her husband, "Bill you need to hear these kids sing." Soon after, Bill signed The Martins to his record label, and the rest is history. Now, a few albums and a few Dove Awards later, these kids from rural Arkansas have reached the pinnacle of success in Christian music. It's no surprise, then, that their latest album is titled Dream Big. The title song, a brief biography of The Martins, is a tumbling river of encouragement inspiring us to avoid limiting God. "We try to do songs that speak about a particular thing in our own lives. Then it's easier to portray the full meaning of a song." Having seen God's dreams come true in their own lives, these siblings sing the chorus with an infectious enthusiasm that's hard to resist.